This years Kentish Town Carnival parade took place last Saturday as part of Kentish Town Festival. After weeks of working with Torriano School, Kentish Town Community Centre Youth Group, Gospel Choir, Little Stars Under 5’s group and the Carnival Group we had a fabulous day on Saturday. The music was directed by TARU Arts who did an amazing job working with a lot of young people. The costumes were made by all participants, together with the head dresses, backpacks, flags, streamers and shakers. We are delighted that we have been given a grant to put towards Kentish Town Carnival parade by the WOMAD Foundation. We are planning to work with local community groups and schools to create a local carnival on the 01/07/2017. Kentish Town Parade is a celebration of our community. It brings together local schools, community groups and local residents. It is a local event featuring a parade and music event as part of Kentish Town Festival. This year Pohela Boishakh, the Bengali New Year celebrations, will inspire the parade. The procession and musical performance will be exploring cultural traditions and art of Bangladesh through various mediums such as music and carnival art. We have been again invited to create giant book characters for this years world book day parade run in collaboration with Watford museum and Watford library. We have been very lucky with weather and had many people participating in the success of the day. We worked with year 5 in Mulberry Primary School, making a short animation on the theme of air pollution. The children worked on the illustrations, animation, sound and learned about other aspects of air pollution through practical workshops. The regular Sunday maintenance session at the nature reserve will focus on starting the Cob oven. Working from the ground up, literally, we will be working on the foundation and starting on the walls. All volunteers welcome! Anyone with previous cob oven building experience, or bricklaying experience, it would be great to have you join us. 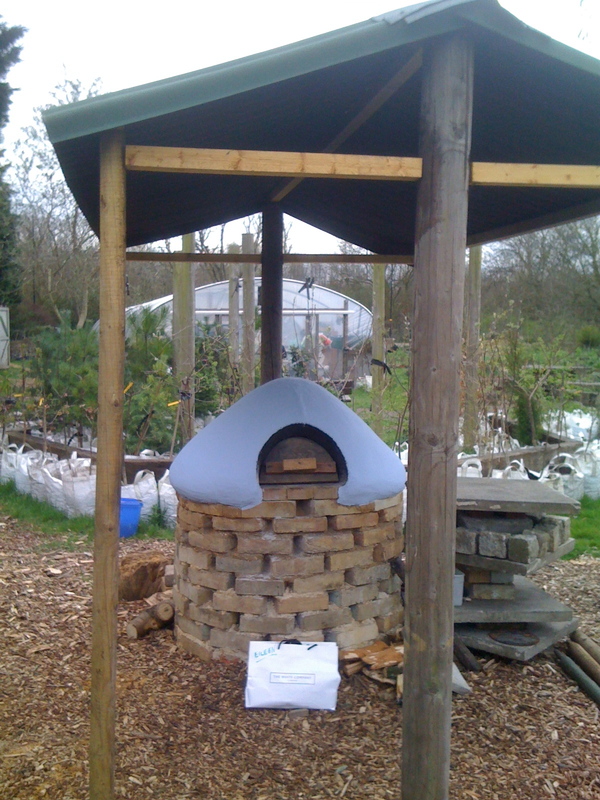 Here’s a photo of the cob oven at the lovely Hackney Tree Nursery and Forest Garden, inspiring! Look Mum, fire and no matches! We had a great day romping around the nature reserve today. We had an enthusiastic gaggle of kids, most of whom mastered the art of lighting a fire in a fire bowl using a fire striker. This takes determination and a bit of patience. Sometimes it takes me a few minutes to get it right! So it was great that most of the kids got there in the end. We cooked our lunch on the campfire, made some Elder bead necklaces and generally got a bit muddy and scruffy. Our home made bread was even flavoured with wild garlic leaves picked on site. Welcome all to the nature reserve; human, flora, fauna! The mosaic welcome sign is up, made from recycled tile, including the letters which are formed of tiny pieces of Victorian china that surface with every dig into the bank of the nectar garden. Sunday was our monthly workday at the reserve. I got stuck into the nectar garden, cutting back a lot of dead perennial structure, digging in seeds and sowing some more with the help of Ben and Lara. I remove some of the alkanet and buttercup but do leave some as they are important nectar forage in the coming weeks. It’s a fine balance, keeping these vigorous natives in check so we have space for other flowers too. I noticed gladly that the patch of nettles that I transplanted from the woodland have taken and are sprouting new growth under the Elder shrub. The rest of the volunteers worked around the main bit of the site, during the tea break Jeanne spotted a brave yellow brimstone butterfly fluttering along the railway. I hope it found what it was looking for on one of the first Spring-like days in a while. Do you know any young forest enthusiasts who would like to join us for outdoorsy fun and adventures at Easter Holiday time? Our Woodland playscheme will run from Monday 8th to Thursday 11th April 2013. 10am to 3pm daily, in all weathers! a morning ramble and games on Hampstead Heath. Suitable for children ages 7-12 years. The playscheme is run by Penny, Nina and Ros – we are all fully qualified and insured Forest School practitioners. We all have enhanced CRB checks. Costs: 4 days attendance – £110. £100 for siblings. single days £30/day. £25 for siblings. Booking priorities will be given to 4 day bookings, single days can be booked where there is availability. Please contact us to register your interest and to find out more details. During 2012 we collaborated with Community by Design to deliver a series of workshops to Camden Primary schools on the theme of Air Quality. Different workshops were designed for each of the schools involved. One of the longer programmes was an animation workshop led by Nina Gebauer and animator Bunny Schendler at Fitzjohn’s Primary, Hampstead. The children produced this fantastic animated film, which you can see at Vimeo. Today we were at City Hall to speak to representatives of 7 London Boroughs as the programme is now being rolled out across London. We had some great feedback on the work we presented. A few families have been in touch enquiring about the toddler group. We aren’t able to run the sessions at the moment but it’s great to get feedback that people are keen. We will resume the sessions in early September once school is back.